This story was updated at 6:27 p.m. ET. Nearly 50 years to the day after cosmonaut Yuri Gagarin became the first person in space, a Russian spacecraft bearing his name blasted off on a trip to the International Space Station. 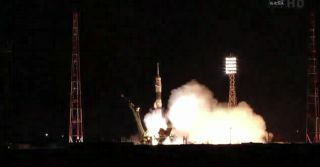 The Soyuz TMA-21 — which has been nicknamed "Gagarin" to honor the cosmonaut's historic flight of April 12, 1961 — launched from Baikonur Cosmodrome in Kazakhstan in Central Asia at 6:18 p.m. EDT today (April 4; 4:18 a.m. April 5 local time). The spacecraft lifted off from the same launch pad used for Gagarin's historic flight nearly 50 years ago. The "Gagarin" is carrying two cosmonauts and one NASA astronaut. They'll reach the station on Wednesday evening (April 6 EDT), joining three spaceflyers already aboard the orbiting lab. "Launch was great, and we're in orbit and we're doing great," Soyuz commander Alexander Samokutyaev said after the launch. "This is a great anniversary flight, and have a great one," Russian mission control radioed back. The "Gagarin" Soyuz was originally set to launch March 29, but a glitch with its radio communications system pushed the flight back to April 4. The launch today appeared to go off without a hitch. The spacecraft's three crewmembers will round out the current Expedition 27 crew aboard the space station, and they'll stay on beyond that mission as part of Expedition 28. All three spaceflyers — and the "Gagarin" — will stay at the space station until September, when they'll come back down to Earth. They'll therefore be aboard the orbiting lab for the last two flights of NASA's space shuttle program, which are set to launch toward the station this April and June. After those two missions, NASA will retire the shuttle program after 30 years of service. "So our six-month mission, in addition to those two shuttle missions that are up there and all the work that’s going to be involved with that, there’s going to be a great deal of science," Garan said in a recent NASA interview. "There's a great deal of science on board right now, there has been for a while, but we're going to really ramp that up even more." At the Baikonur Cosmodrome in Kazakhstan, NASA astronaut Ron Garan (left), Expedition 27 flight engineer; along with Russian cosmonauts Alexander Samokutyaev (center), Soyuz commander; and Andrey Borisenko, flight engineer, pose for pictures outside their Soyuz TMA-21 spacecraft during a check of its systems March 22, 2011. The three crewmembers already aboard the station — cosmonaut Dmitry Kondratyev, NASA astronaut Cady Coleman and European spaceflyer Paolo Nespoli — have been there since December. They're scheduled to return to Earth in May. This is the first time that a Soyuz has been named after anyone, according to Russian officials. The spacecraft's booster rocket was emblazoned with a larger-than-life likeness of Gagarin, along with the cosmonaut's name and a big, bold "50." Gagarin's flight back in 1961 was a significant victory for the Soviet Union in their escalating space race with the United States. It opened wounds first inflicted by the Soviets' surprise launch of Sputnik I — the world's first artificial satellite — in October 1957. The United States countered less than a month later, when Alan Shepard briefly reached suborbital space in the Freedom 7 vehicle on May 5. So the three spaceflyers on the "Yuri Gagarin" will be aboard the station for the 50th anniversary of that flight, too — as well as the 30th anniversary of the space shuttle's maiden launch, which took place April 12, 1981. "I think this is a very fortunate time to be flying in space," Garan said. "In addition to the research, I think it's also very important to recognize these significant milestones." While Gagarin's name will live forever in the history books, the man himself died tragically young. His plane crashed during a military training exercise in 1968, killing the cosmonaut at the age of 34.